This is the American Wasteland. 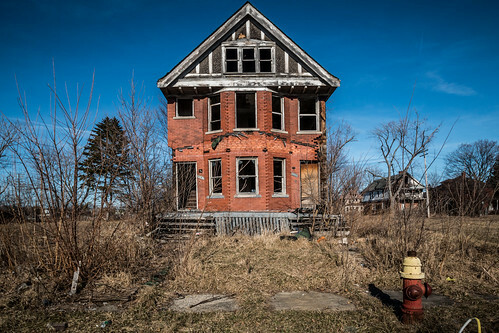 If any place in America needs to be made great again, it is Detroit. While cutting across the neighborhoods with no destination in mind I was struck by how barren the city can be. A turn off a main street will lead to a neighborhood without light poles, signs, or human inhabitants. Abandoned homes, churches God forgot, and former liquor stores litter the landscape, seemingly waiting for the inevitable day that some vagrant trying to keep warm, a drug addict cooking up, or some arsonist will burn the structure to the ground. The most common question asked of me was, “Are you taking pictures because they’re going to demolish?” No. I am not. I’m just an outsider.